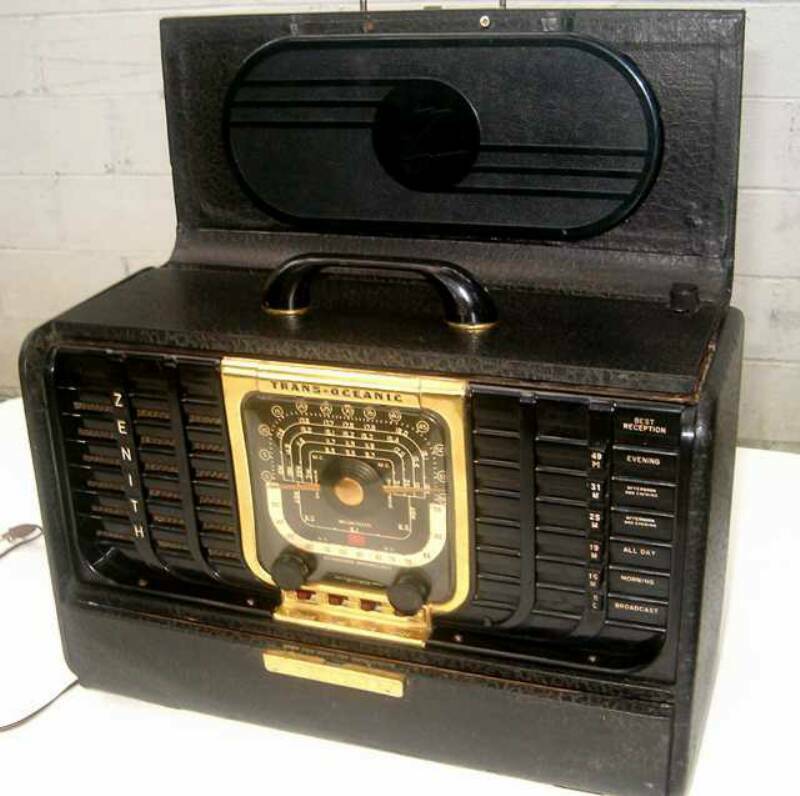 The station was originally launched in 1929 as AM 645 CKCR. The station's frequency moved to 1510 in 1934. In 1949, FM sister station CKCR-FM was launched. (CKCR was formerly a call sign used at a radio station in Saint John, New Brunswick, and later in Revelstoke, British Columbia. It's uncertain, if the CKCR call letters are still being used today). The following was taken from the Nov. 1, 1924, Radio Service Bulletin, a publication of the U. S. government. Wavelengths are in meters; there is a question mark in parentheses after the CHCO call in the original; CGAC is shown in two locations; no wavelengths are given for two stations in the original. CFCA Toronto Ont Star Publishing & Printing Co.
CKCR St. John NB Jones Electric Co. Downtown King Street, CKCR sign idents location of studios. A photo from 1961. When Gary was doing mornings it was called "The Good Morning Show" and somehow Gary became labelled as "Laffin Megaffin" as he used to laugh at his own jokes...no one else did, but he did...! What real radio looked like in 1961. On The Board. Turn-tables, Ampex tape machines, reading copy live, cueing up LP's, and answering the phones and no operator...! "When I started to include some "Open Line" phone calls into the mix of the morning show, a woman called one morning and said she was playing baseball on the street with her kids and their friends. She wondered if she should do this and what would people think. Well the phones exploded with support. Schaus, hearing this came running into the control room, when he arrived at the station that morning, and said, "I've got a great idea." He said we would form a CKCR Ladies Baseball League. Each announcer was the manager of a team and we played throughout that summer at the park just off Strange Street. 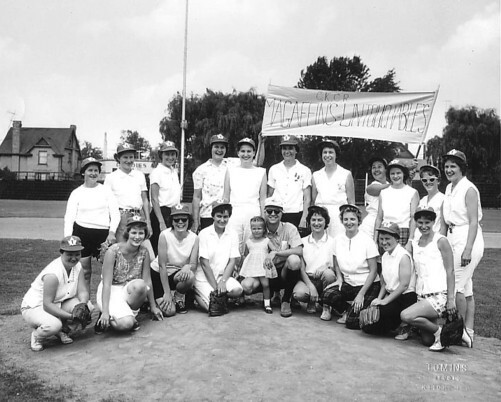 To organize the promotion we asked that anyone who was interested in playing for the CKCR Ladies Baseball League to attend a meeting at the Auditorium. 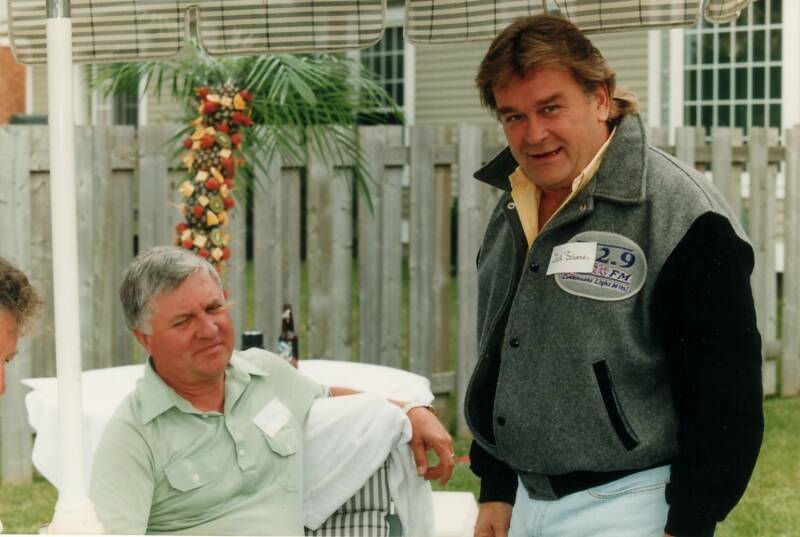 Here are two photos of that meeting with Don Cameron, Gord Schaus, Jack Schoone, Ian Byers and John Hodges. At the end of league play the top two teams played off for the CKCR Trophy. 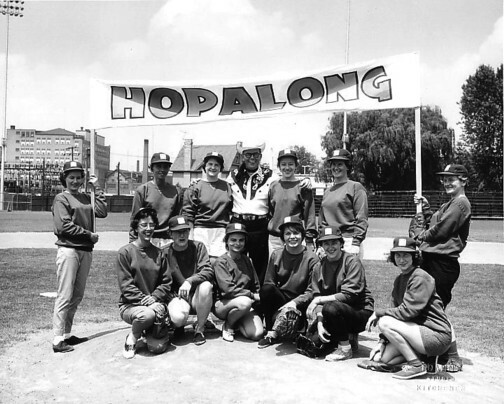 Fortunately my team "Megaffin's Untouchables" and Hoppy's team "Hopalong's All-Stars" played for the trophy and here we are arriving for the big game in style." CKCR-AM began in 1929 when John Patterson obtained a licence to broadcast on 645 AM with a power of 50 watts. 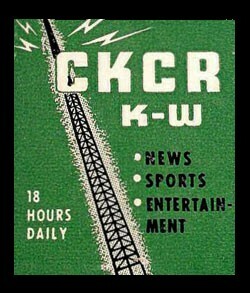 Ownership changed to Kitchener-Waterloo Broadcasting in 1934 and CKCR-AM began broadcasting on 1510 AM. In 1949 Clyde Mitchell and Gilbert 'Gib' Liddle, owners of CKCR-AM now broadcasting on 1490 AM, received a licence for an FM station in the Kitchener-Waterloo market. Adding an FM station was more a defensive gesture than anything. Transmitting on FM was relatively inexpensive, and should the medium take off, CKCR would be ready. CKCR-FM signed on the air later in the year, simulcasting the programs of its AM sister station. The FM operated on 96.7 MHz with a power of 350 watts. Studios were in the Arcade Building, 125 King Street East, in downtown Kitchener. CKCR was a CBC Dominion affiliate and became known as CKCR-AM and FM The Twin Voice of The Twin Cities. In 1963, J. Irving Zucker and Sydney Paikin purchased Kitchener-Waterloo Broadcasting Co. Ltd, ending the Mitchell-Liddle era. Zucker and Paikin were the owners of CHIQ in Hamilton. Zucker and Paikin were major shareholders in CHIQ-AM in Hamilton. In 1965 Greatlakes Broadcasting System Ltd., a partnership that included Maclean-Hunter Ltd. (50%), Don Hildebrand (25%) and Clair L. Chambers (25%) purchased CKCR AM and FM. Greatlakes Broadcasting System Ltd. was formed by the merger of Kitchener-Waterloo Broadcasting Ltd. with Greatlakes Broadcasting Ltd., owner of CFOR Orillia and CFCO Chatham. On February 25, the ending of an era came when CKCR-AM-FM became CHYM-AM-FM. 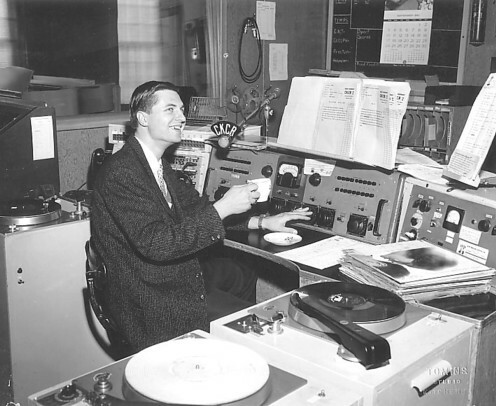 In the early 60’s at the height of CKCR’s radio dominance in the twin cities staff included the following. 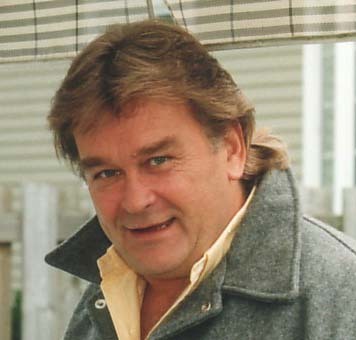 Gord Schaus was the manager while Jack Schoone was the station accountant as well as hosting the Night Hawk Show on the weekends. Grantly also had his rock-n-roll show on weekends. Molly Zak was our astute librarian. Jenny Lavery handled traffic while Murray Davidson was copy chief while handling some on-air duties. Ion Hartman kept us on the air as CKCR’s engineer. 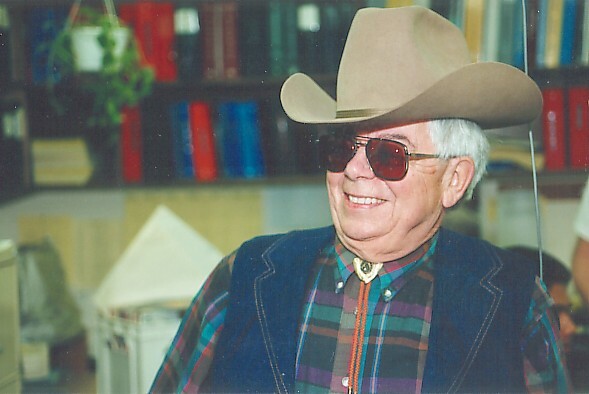 Hoppy handled the daily Hiway Market Show and his Country Music Show while fulfilling his duties in sales. Dave Cash as head of production also filled in on-air as needed. Here's a shot of "HOPPY" from 1995. 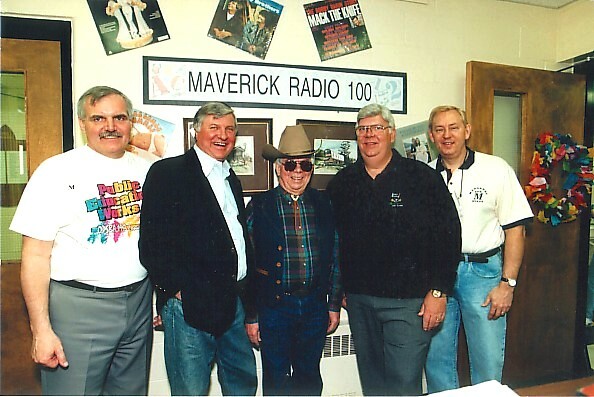 He was one of the most popular radio personalities in the twin cities, and had a loyal following not only for his radio shows, but for the "Search For Talent" live shows he ran throughout the county. 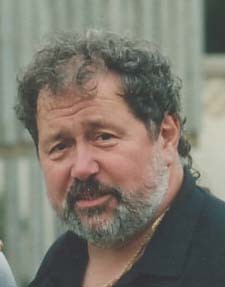 Hoppy played an important part in the career of several local country artists. 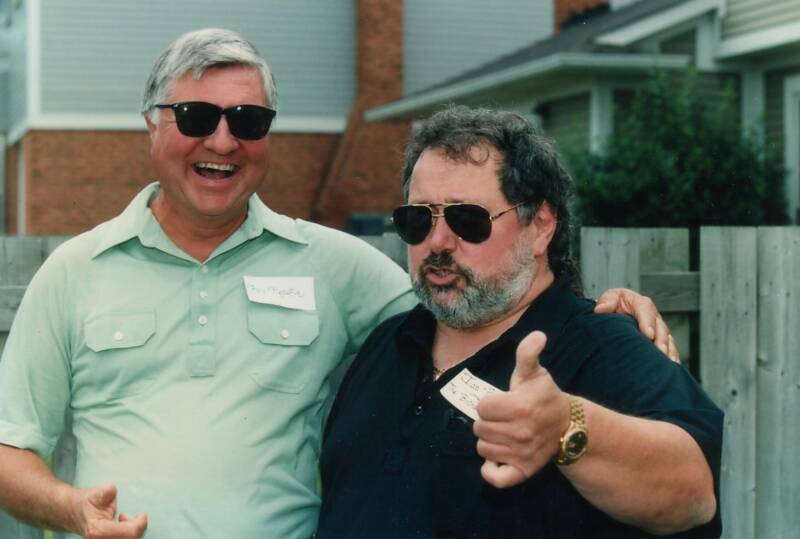 He began on air with CKCR and eventually moved to CKKW, where he spend many years in the sales department and on air with his "Saturday Morning Jambouree" John "Hoppy" Hodges a local "character" who will be remembered fondly by his fans and friends. Getting together in 1995 to shoot the breeze about the good ol' days at CKCR. L to R, Grant Hoffman "Grantly", John "Hoppy" Hodges, and Gary "Laffin" Megaffin. Jack Schoone, a man who learned to love radio, had a penchant for buying radio stations. His appetite to be an owner was kindled when Hamlton’s Irving Zucker hired him in 1959 to be the controller for two Kitchener radio stations that he had just bought. While, following his discharge from the Canadian Army, Jack had studied to become an accountant, he soon found his way to a microphone. 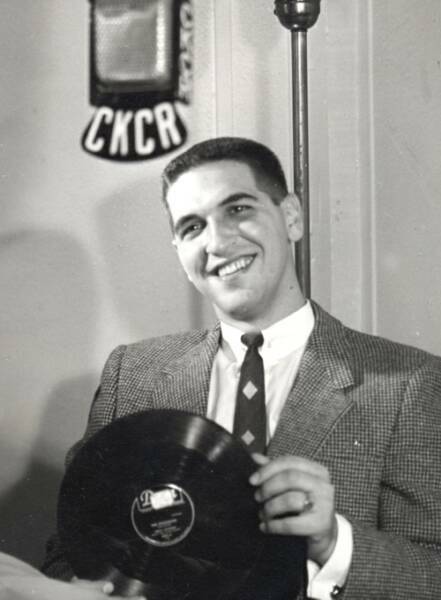 Two years later, at 23, he was the manager of CKCR-AM and FM. And so began a long and profitable relationship with Irving that lasted until the respected Hamilton neo-philanthropist and art collector died in 2002. In no time at all, Jack’s authority in Kitchener was extended to include Irving’s fledgling but struggling CHIQ in Hamilton. While Irving Zucker was well on his way to becoming a self-made millionaire, he did not at that time enrich his fortune from radio. The stations were sold and Jack was out of the broadcasting business. But not for long. Determined to be an owner, in 1969 Jack found just what he was looking for. In a small northern New Brunswick town, CKNB Campbellton was for sale. With some input from Irving, Jack bought it. Eastern Broadcasting was born. Then another small station in Miramichi. 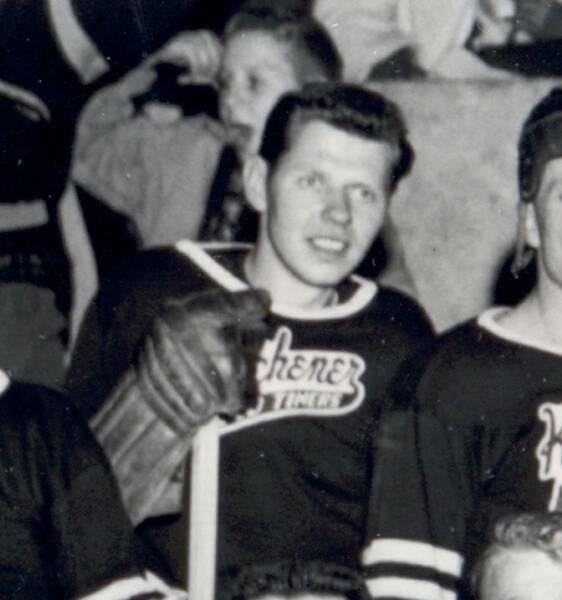 Eastern then moved in on northern Ontario and bought Roy Thomson’s four stations in Timmins, North Bay, Kirkland Lake and New Liskeard. Then it was a jump to southern Ontario and the acquisition of the holdings of Countryside Broadcasting in Orillia, Midland, Huntsville, Parry Sound, Woodstock and Stratford. The year was now 1977. The score -- 23 stations. In 2003, Jack Schoone was rewarded with something that money can’t buy -- a well-earned place of honour in the CAB Broadcast Hall of Fame. Once home, Sandrock went to work. Waterloo MP (and Minister of National Revenue) W.D. Euler promised to smooth the way with the federal government. Sandrock then secured five thousand dollars in advertising commitment from Kitchener-Waterloo businesses. While strolling along King Street in Waterloo, Sandrock noticed some unoccupied office space above Weichel's Hardware store. He promptly button holed the owner, W.G. Weichel, who was less-than-excited about donating the space. 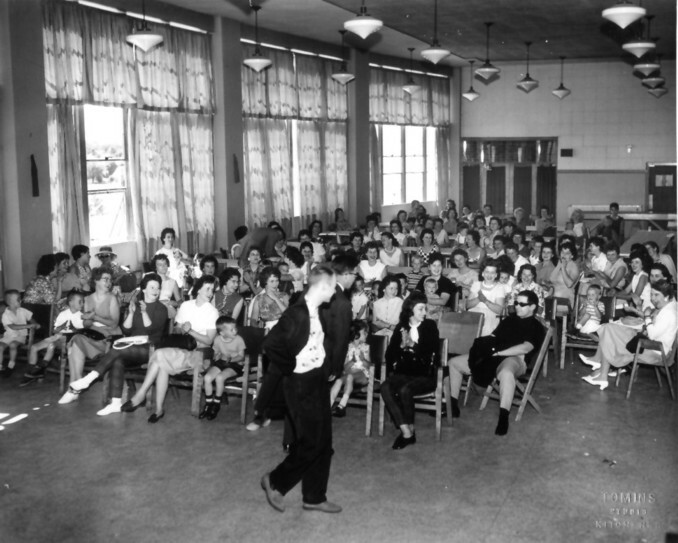 Undeterred, Sandrock won Weichel over with visions of free publicity for the hardware store. With all the pieces in place, Sandrock had little difficulty selling Patterson on the move. 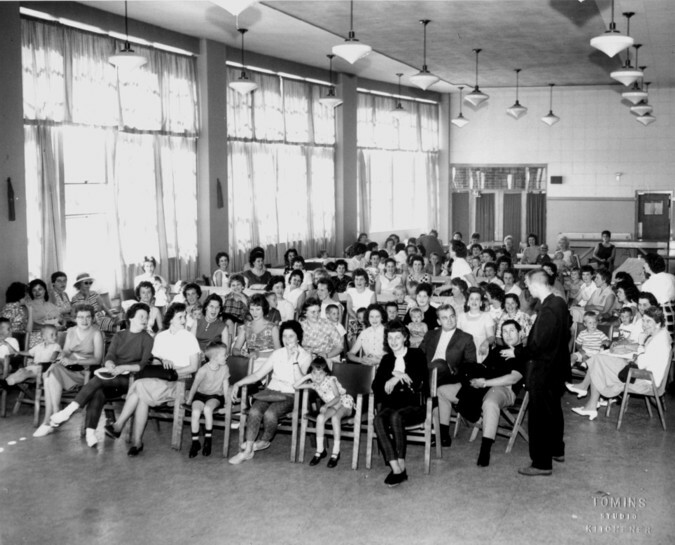 By this time, CKCR's broadcasts gravitated to the station's alternate address, in Kitchener's Walper Hotel. The frequency shifted to 645 kHz with 50 watts. On March 29, CKCR moved from 1510 to 1490 kHz. Gilbert Liddle passed away while on vacation. A government report showed the ownership of Kitchener-Waterloo Broadcasting Co. Ltd. as follows: Gilbert Liddle estate 49.7%, Mrs. Ruth Liddle 0.29%, J. Liddle 0.01%, Mrs. Ella Mitchell 49.7%, J.C. Mitchell 0.3%. J. Irving Zucker and Sydney Paikin purchased Kitchener-Waterloo Broadcasting Co. Ltd, ending the Mitchell-Liddle era. Zucker and Paikin were the owners of CHIQ in Hamilton. Zucker and Paikin were major shareholders in CHIQ-AM in Hamilton. J. Irving Zucker’s Kitchener-Waterloo Broadcasting Co. Ltd. received approval to sell CKCR-AM and FM to Great Lakes Broadcasting Ltd. D. G. Hildebrand was president of Great Lakes and would be general manager of the Kitchener stations. He owned CFCO Chatham and CFOR in Orillia. 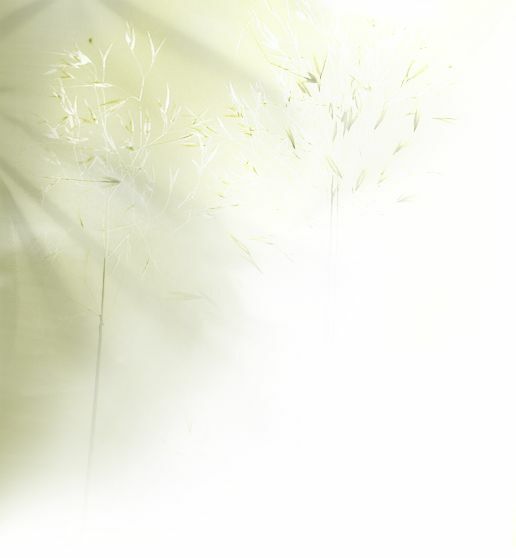 music from 10:00 ~ 11:00 and 4:00 ~ 5:00 and then the 6:30pm news. 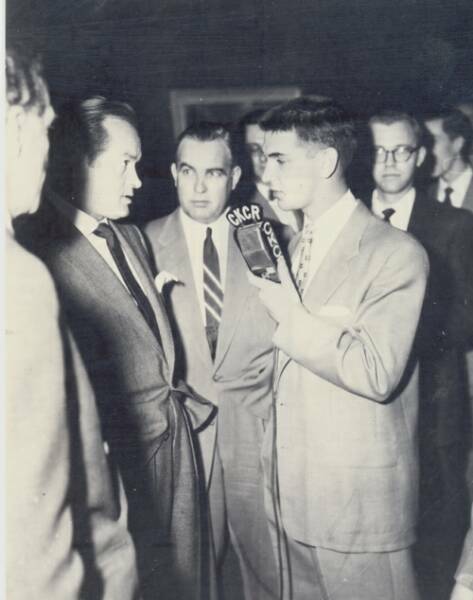 1954: Here's Reg interviewing Bob Hope. 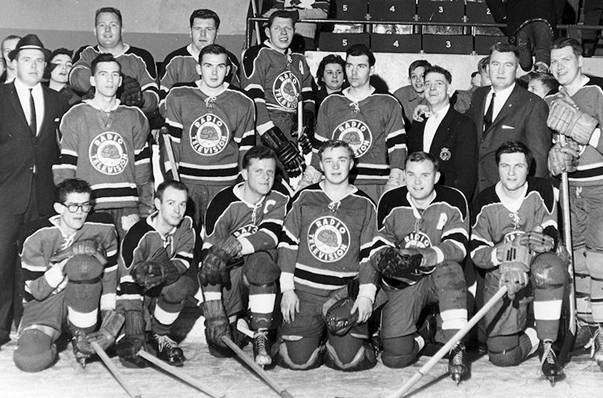 1954: Here's the CKCR hockey team, put together as a "media team" to play in the Rotary Benefit Hockey Game. I've isolated a few familiar faces, have a good look at the picture and see if you can ident the rest and then let me know. 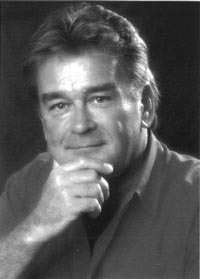 Ian Byers: Ian was one of the radio personalities on CKCR in the 60's"
HUNTSVILLE, Ontario -- Veteran Canadian broadcaster Ian Byers has died. 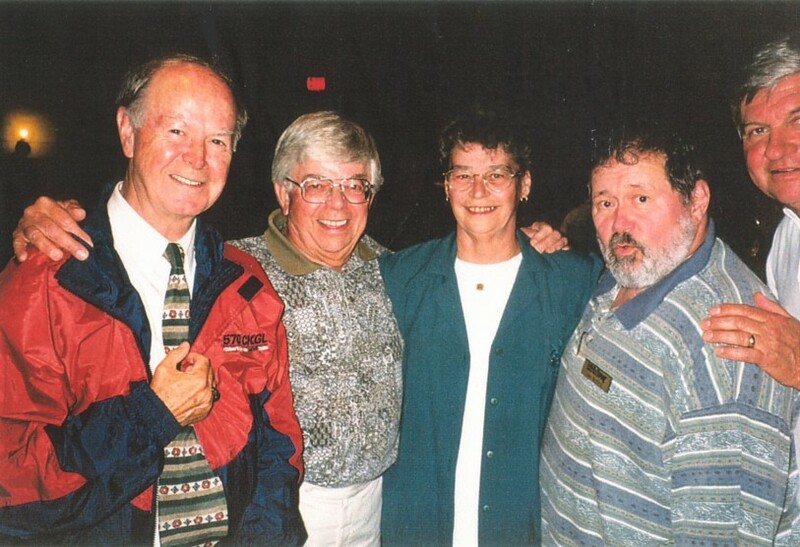 The former owner of Huntsville, Ontario radio station CFBK-FM passed away suddenly yesterday at the age of 73. Throughout his 55 years in broadcasting, Byers was a mentor to many and dedicated himself to civic and industry associations. 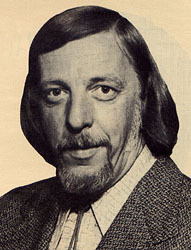 His early career days were spent in Kitchener and Hamilton, where he met Jack Schoone who went on to head Eastern Broadcasting. Byers spent many years with Eastern at CFAN Newcastle, New Brunswick before acquiring the Huntsville, Ontario station in the early 90's. He sold the station to the Haliburton Broadcasting Group last year. Byers is survived by his wife Margaret, two daughters and three grandchildren. A private family burial service will take place in Orillia with a memorial to follow at a later date. I loved working with the man credited with the first 'fade', the immortal Frank Ward. He made radio exciting and fun. A great set of pipes. Frank came to WSAI in Cincinnati as P.D. from WKBW in Buffalo. 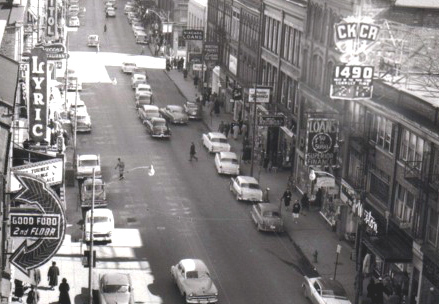 In those days, WSAI was located in the Sinton Hotel in downtown Cincinnati, Ohio. I was doing overnites at the time, and it was about 2AM when the studio door swung open, and there he stood: about 6'5" -- in his pajamas! I was stunned. Thought it was some drunk who had wandered in from the hotel (we had our share of them doing that, with no lock on the door). His first words were, "Don't cough before you open your mic...swallow, and save your pipes!" Only then did he introduce himself. He taught me all the basics I needed to become more proficient almost instantly. Radio has changed dramatically since then, but I sure learned from the best. Another great mentor whose tricks with editing still stick with me is Mel Hall, from KDEO in San Diego. One of the greatest "blades" in tape-editing! Mel went on to PD at KRLA in LA and WJJD in Chicago. A tremendous talent with a voice to match! "Dan, here are a couple of photos of Ian's 60th birthday celebrations taken at his daughter's in St. Catharines by Darryl Dahmer." Gary with wife Joyce and Ian. 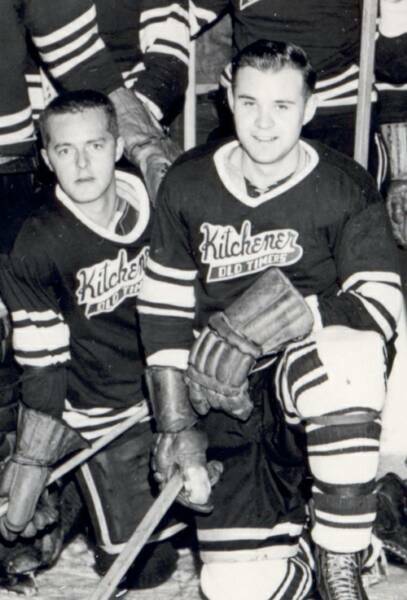 Dan's Note: When Darryl Dahmer was just a teen, he began his broadcasting career as an operator with CKKW. 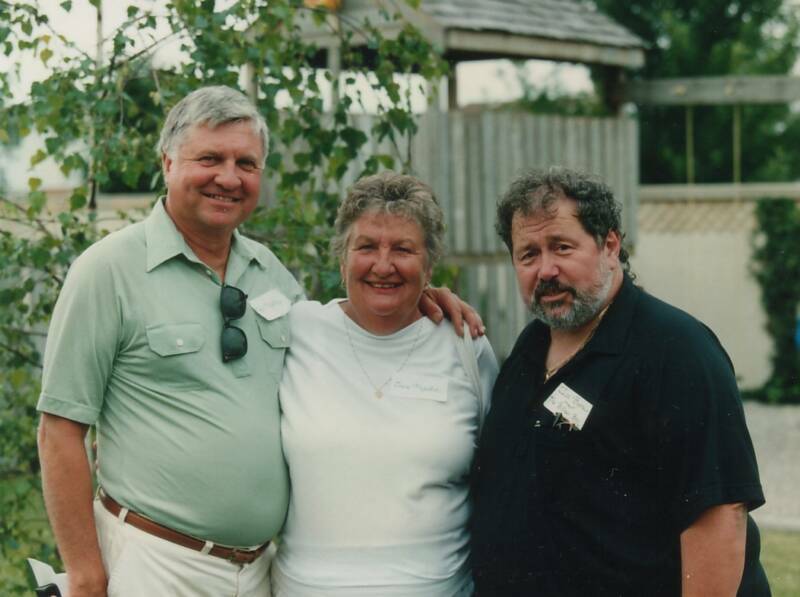 At one time during those early years he was the operator on my talk show "OPINION"
"Photo by Kitchener Waterloo Record from local history collection of rych mills"
Center: Joe McIntyre CKCO, Murray Davidson CKCR, Gary McLaren, Len Collis CKCO, ? ?, ?? ?? Here's a couple of new items from Gary Megaffin. Margaret Byers ( Ian's widow) sent these two ads to Gary from material that Ian has set aside over the years. 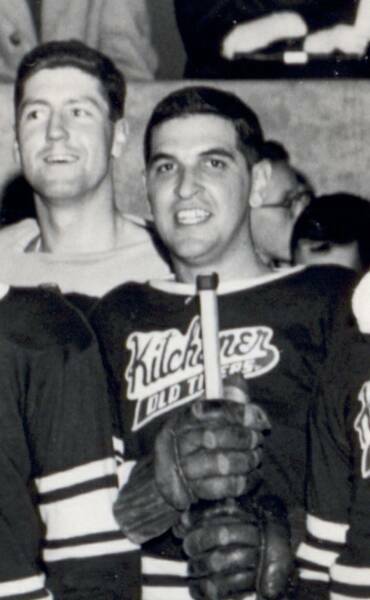 We see a very young Don Cameron and ditto for Hoppy.. Check out the songs on the song list from June 1964. Ya gotta love that Millie Small!! #1, "My Boy Lollipop"